Hello Maja Design fans, it’s Gabrielle here with you today! I don’t know about you, but I have so much to be thankful for, so for me it’s important to always have lots of pretty ‘Thank-you’ cards on hand. I made this card for a dear friend who has been so generous with me, I wanted to say thanks to her in a way that shows my deep appreciation for her friendship. For this card I mainly used papers from the Maja Design ‘Enjoying the Outdoors’ collection. 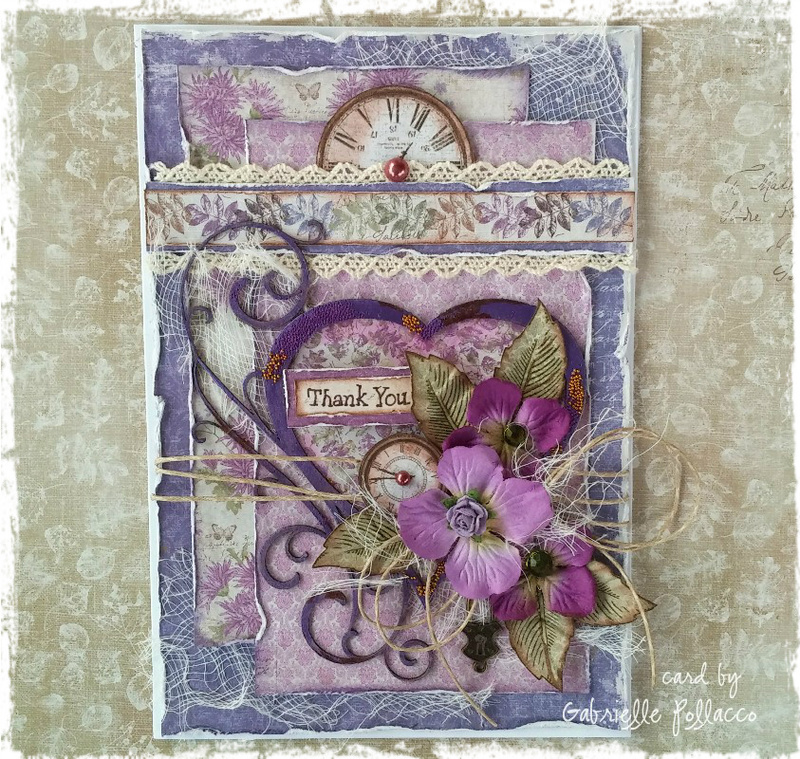 I used ‘Late Summer Flowers-bs’ for the background of my card. Then I opened my pack of Enjoying the Outdoors 6×6 paper pack and layered a variety of the patterned papers onto my card, using one of the mini-print floral papers as the inside of my heart design. 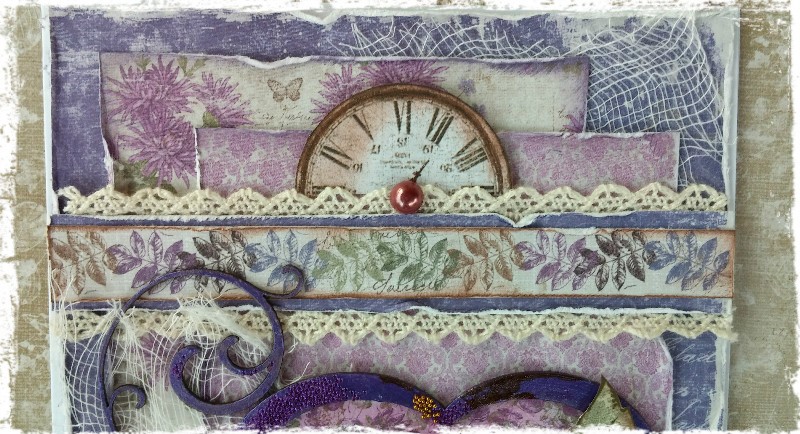 Another paper that I find indispensable is the clock paper ‘XVI’ from the Vintage Autumn Basics collection. I usually take a moment to cut out all the clocks and keep them in a little plastic baggie so I have them handy for embellishing my projects. Another little tip: I never throw out the paper strips from the bottom of my 12×12 paper pads, they come in so handy for decorating my projects as you can see here. A sweet friend of my sent me a bunch of chipboard frame designs, among them was this heart design. I painted the heart with Shimmerz Paints ‘Grape-tastic’ Dazzlerz, this is a thick pearlescent paint that goes on beautifully in one coat. While the paint was still wet I sprinkled on some bronze and purple micro beads (no name dollar store brand). 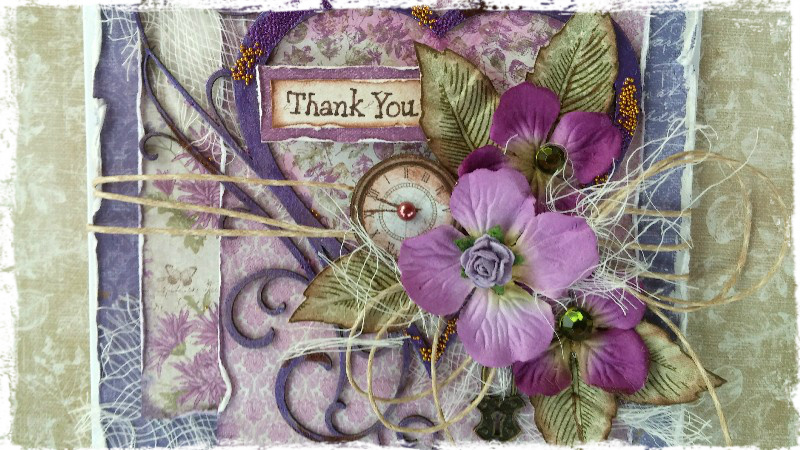 I then finished the card design by adding a few Prima Hydrangea’s in a purple color and used a leaf stamp from one of my stamp sets that I designed for The Scrapbook Diaries….these I stamped onto the ‘Woodlands’ paper, cut out and slightly crinkled them, then just tucked them into the floral cluster.